Sundial Cove combines all the comforts of home with all the fantasies of a private Caribbean hide-away. Located on a quiet stretch of seashore, this 2-bedroom house provides a panoramic view of the ocean from every window. A unique private pool means you can swim anytime, regardless of the mood of the ocean. Snorkeling and beachcombing are at the doorstep. Shopping locations for groceries and basic amenities are within walking distance. Amenities: fully equipped kitchen, Washer & dryer, color satellite TV, DVD, Stereo, free WiFi, Private Pool & sun deck, Linens & towels. Activities: Magnificent sunsets are yours for the viewing from the spacious seaside patio. Easy access for snorkeling and diving just a few steps up the beach. Every day is a good swimming day in Sundial Cove's private pool. Travel to Cayman Brac by air via Grand Cayman, B.W.I. The 12 square miles of Cayman Brac may be explored at your leisure. Enjoy the bluff, the caves, the beaches and the villages. Sundial Cove is located on the north side of the island, just off the main road, 3 miles from the airport. Airport pick-up is provided. Car rental available. 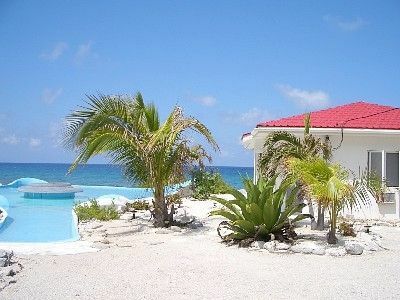 Sundial Cove is located at Cotton Tree Bay on the northwest side of the tiny island of Cayman Brac. It is 90 miles by air from the island of Grand Cayman.